Crafted from premium thermoplastic polyurethane (TPU) and polycarbonate (PC), the all-new vArmor is designed with stronger and reinforced corners to provide robust all-round protection for your Galaxy S7. 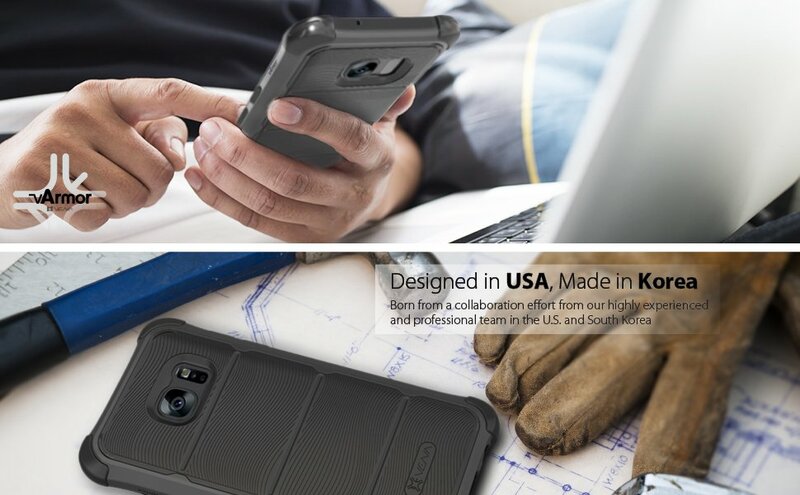 The sturdy and ergonomic design of vArmor enhances user's experience while protecting your Galaxy S7 with CornerGuard TM technology, engineered to disperse force from shock and impact through the TPU. The precised craftsmanship of vArmor lifts your Galaxy S7 from the surface when placed down, keeping your display and rear camera clean and scratch-free. The power and volume buttons are carefully crafted to maintain the same great tactile feedback from your phone's buttons. The non-slip ruggedized grip on the side provides additional grip to your device. Vena vArmor is reinforced with precision cut-outs to suit the Galaxy S7 and provides effortless access to all ports, buttons, and features. vArmor is exclusively designed, and an extremely well thought-out case that is born from a collaboration effort from our highly experienced and professional teams in U.S. and South Korea. LOVE MY GALAXY CASE, I drop my phone a lot an so far it has done the job! Color is pretty but I dislike the textured back, and the photo make a it look much more protective. There is a little protection on the corners but the front is almost flush with the screen so there is little protection if you drop it.